Precision-scale pewter starship miniatures: Klingon C8 dreadnought, D6 heavy cruiser, D7 battlecruiser, C7 heavy battlecruiser, and F5 frigate. Includes stands; for gaming or display. 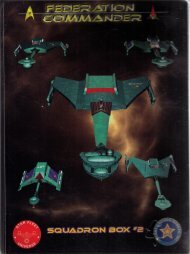 These ships are the five Klingon ships in FEDERATION COMMANDER: KLINGON BORDER.